KAMPALA– After works and transport ministry announced that direct flights between Tel Aviv and Entebbe are expected to commence early next year, deputy speaker of Parliament Jacob Oulanyah has called on the Embassy of Israel based in Kenya, to ease visa restrictions for Ugandans. Deputy Speaker Oulanyah wants the Middle East controversial country to ease restrictions for Ugandans seeking to travel for study and tourism purposes saying that many Ugandans are eager to go to Israel and thus making it easy for them to access the Holy Land would additionally promote Israel’s tourism potential. 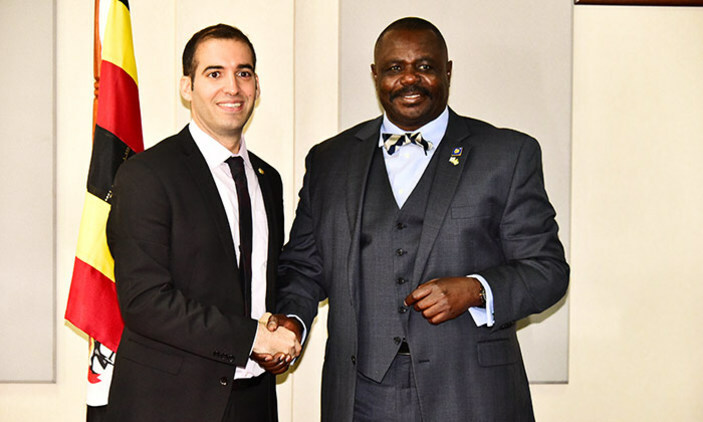 Oulanyah made the remarks while meeting the Deputy Ambassador of Israel to Uganda, Kenya, Tanzania, Seychelles and Malawi – Eyal David, whom he hosted at Parliament. The deputy speaker also lauded Israel for technological advancement in agricultural management saying Ugandan farmers could take advantage of learning, so as to improve on their farm yields even during the dry seasons. “You have pioneered and provided leadership in water use and water management. In Uganda, we have not yet mastered how to make the drought season and rainy season complement each other. Our farmers can learn how to perfect this through exchange visits,” Oulanyah told the meeting. On his part, the new Deputy Ambassador lauded the good relations between Uganda and Israel. He noted that several Israeli Non-Governmental Organizations had set up the base to serve in different regions of the country. “I had a meeting with the Health Minister to discuss one of our flagship projects based in Kiboga, where we opened a diabetes clinic. We are collaborating with the ministry to spread the initiative all-over Uganda,” Eyal told the meeting. Over 220 students are sent annually to Israel, to get apprenticeship and training.